MySciLEARN provides demo versions of the Fast ForWord products that allow staff to step through the product exercises as a demonstration for students, parents, or other interested parties. In addition, students can use the demos to explore the exercises on their own. Demos are intended for demonstration purposes only, and do not save points and will not save a student's status in the exercises. 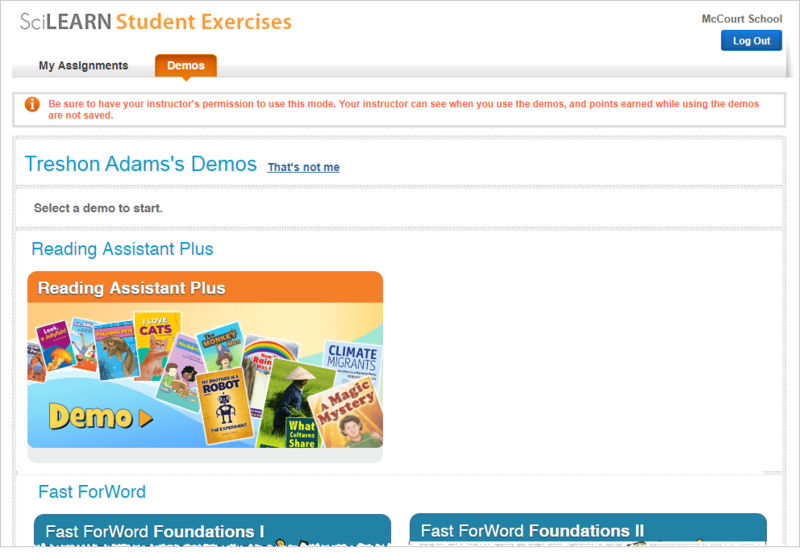 You can disable demo access for a student if needed, and the student will not see any demos on the Demos screen (see Set student access to demos for details). Tip: For students using iPad, follow the steps in Fast ForWord demos on iPad. Staff members can demo the Fast ForWord exercises on a computer, as detailed in this topic. From any computer connected to the Internet, log in to MySciLEARN as a staff member. Click the Manage tab to access the Manage section. Click the Exercise Demos button in the upper right corner of any page. For students using iPad, follow the steps in Fast ForWord demos on iPad. 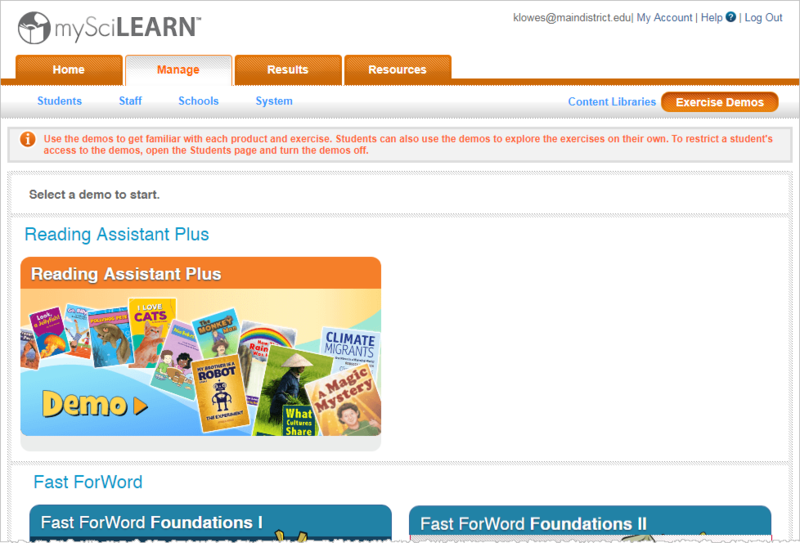 From any computer connected to the Internet, log in to MySciLEARN (see Log in as a student). The Student Exercises page opens. If another student's name appears on the Student Exercises page, the student should click That’s Not Me to log out and return to the Student Login page, then log in with his or her username and password. Click the Demos tab at the top of the Student Exercises page. Choose a product and select an entry point for an exercise. Each Fast ForWord product demo provides multiple entry points at different levels in the product, along with both Spanish and English Introductions. When you select an entry point, the exercise demo session starts. Work on the Fast ForWord exercise demo. Each exercise demo session has a time limit of 20 minutes, after which the Success Viewer or Today’s report appears so you can explore a few examples of exercise performance. To end the demo session, click Exit. You can also exit a demo session early (see the next task). An exercise demo session has a time limit of 20 minutes. To exit a demo session early, use the Exit buttons within an exercise as follows. While in an exercise demo, click the Menu button, then click Exit to close the exercise. Click Exit on Today’s schedule. Click Exit on Today’s report to end that demo session. While in an exercise demo, access the Status screen. Click Exit on the Status screen to close the exercise. Click Exit on the Success Viewer to end that demo session.